The American flag waving in the wind, framing the Liberty Statue in front of the New York New York Hotel and Casino Resort in Las Vegas, Nevada. 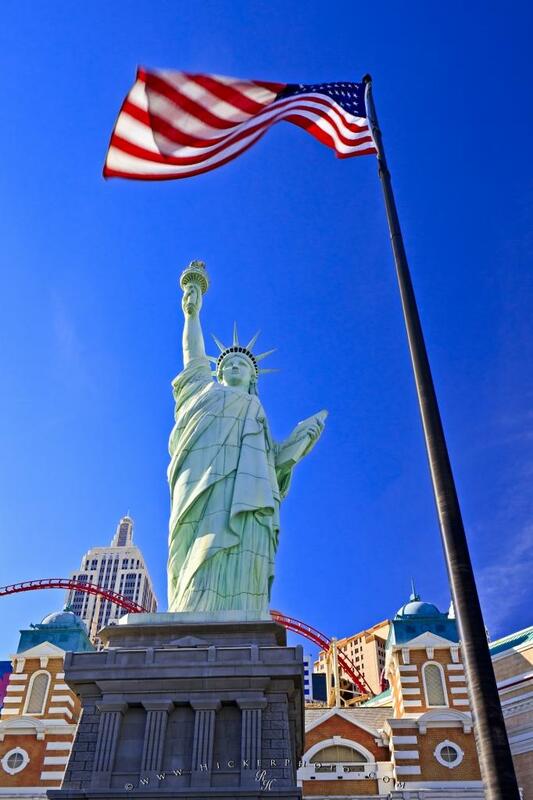 The New York New York Hotel and Casino in Las Vegas shows a replica of the New York skyline, the New York Harbor and the Statue of Liberty which is located in the front of the famous Las Vegas Casino. To make the photograph more interesting I used the American Flag which was nicely waving in the wind to frame the statue and the skyline in back. Photo of the Statue of Liberty, framed with an American Flag at the New York New York Casino.